Winter Sports; The paradox of needing the snow for them to exist, yet creating a snow melting carbon footprint in order to enjoy it. The cumulative impact from years of burning fossil fuels and making things from plastic combined with our lack of political will to change things has put the lifestyle and the sports we love in peril. Snow cover is shrinking, and the seasons are becoming more unpredictable. Resorts based at less than 1500m are looking for alternate income streams after the predictions that the snow line will rise and even high altitude resorts are having to look for investment in artificial snow making. It all sounds a bit depressing, but is there anything you can do? There is a shared idea that reducing your impact on the environment ends up costing you more. Organic food costs more than processed, renewable energy sources are more expensive than coal, Patagonia is more expensive than Primark, and eco friendly getaway’s are pricier than a traditional hotel…etc. But reducing your footprint doesn’t actually have to cost you more. In fact, the biggest reductions can actually end up saving you money! Here’s a few ways you can enjoy your ski trip and reduce your impact on the planet. Your ski trip’s biggest contribution to CO2 comes from your transport. You can cut your carbon footprint by 90% by travelling greener! Flying from London to the Alps contributes 82Kg of CO2/person, while taking the snow train for the same journey only contributes 14Kg and costs under £150 return. Driving to the Alps is 225Kg per car (so approx. 56Kg/person if 4 people are sharing). Tour operators like Inghams, Crystal Ski, Snow Carbon, and other major providers are offering the train as part of the package instead of a flight and in reality it's a pretty similar affair. Check in, load bags, find seat, read book/watch film/figure out your new camera, arrive and find your transfer coach to resort. While the train takes a bit longer it can be ideal if you manage to overnight it. It's pretty cool to fall asleep in London and wake up in France on your way to the Alps! Most resorts provide free public transport which is much less CO2 per user than a taxi or a car, although it's worth mentioning that some resorts are now totally car free which is obviously involves a bit more walking! This is becoming knows as “Soft Mobility” and includes everything from E-Bikes to horse drawn vehicles (Switzerland) as low carbon alternatives. Each season more resorts are looking at ways they can increase their sustainability, reduce their energy consumption, and preserve their environment. You as a customer have huge power here. Where you choose to go either endorses or undermines the policy they choose. By choosing resorts that are more sustainable you encourage every other resort to follow suit. The same is true of every purchase you make; your money is a vote! 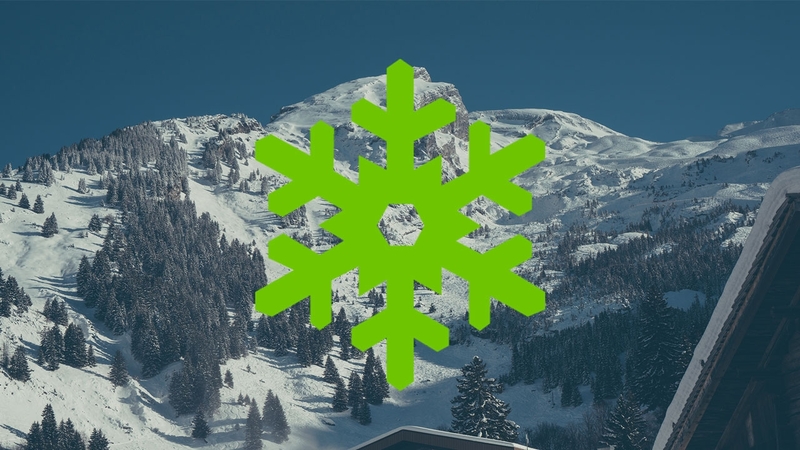 Most resorts have sections on their website where they continually update their environmental programs like Laax’s Greenstyle Foundation and Chamonix getting Flocon Vert accredited! There are several ways you can find out who’s making strides and improving their eco credentials. Organisations like Protect Our Winters, Flocon-Vert, Responsible Travel, and others are reporting on these issues all the time and in some cases offer a badge to show that the resort conforms to certain environmental standards! I’ll include a few links lower down. The resorts making these choices are generally the same price as their competitors and as such it doesn’t negatively affect the cost of your holiday. One of the issues facing the outdoor industry is our need for technical clothing manufactured from plastics that are directly damaging the environments we want to go out and enjoy. The biggest effects of this industry can be avoided by extending the life of your garments. Initiative’s like Patagonia’s “Repair Is A Radical Act” set out to keep your gear going longer, reducing the overall consumption by a huge margin! If you do need to replace your gear, choosing clothing that is high quality so that it has a long life span costs you less in the long run. A high quality, eco-friendly garment that lasts at more than 5 seasons is cheaper than a lower quality one that needs replacing every season or so. Some forward thinking companies have made huge advances in their approach to manufacturing, not just in carbon footprint but also in social impact. Brands like Patagonia are fighting for social change and living wages for everyone involved in every aspect of their supply chain, as well as ecologically sound manufacturing processes. Picture Organic Clothing make all their clothes from recycled materials as well as reducing waste and pioneering manufacturing techniques to minimise off cuts and by product, plus they allow you to calculate the carbon footprint of any one of their products before you buy it. When you are looking at the brands you can keep an eye out for badges like Bluesign, Soil Association, and Fair Trade that show various commitments to sustainable practices. Again, your money is a huge vote here and you can affect change by supporting those who make sustainable choices. For those of us who love to be in the mountains, the effects of climate change have been extremely apparent. As winter enthusiasts we have a duty of care to the environments we use and in a wider sense to try and mitigate the impacts of our industry. The choices we make, even the little ones, can make a lasting difference. Check out some of the links below for more information on sustainable skiing. http://www.flocon-vert.org/ - French group assessing and awarding an accreditation to resorts that meet their environmental standards. https://protectourwinters.uk/ - UK branch of POW who regularly blog about sustainable news stories and offer advice. https://saveoursnow.com/ - Impartial compiler and publisher of data on what the ski industry and ski resorts are doing to combat climate change. https://www.alpine-pearls.com/en/ - Travel company specialising in soft mobility vacations. https://www.laax.com/en/info/greenstyle - Info on Laax's Greenstyle Foundation.